Recently, I received an interesting letter from Bob Frazee. He wrote: "I am participating in a search for statues in Minnesota. I am told there is a statue of a mermaid in Aitkin county. Do you know where it is located?" After contacting two Aitkin County historians, Stacy Vellas and Tommy Joe Fulton, I answered him: "So far, we haven't found her! I did a search on Google (1070 references) and discovered there are copies of the statue in the Forest Lawn Cemetery in Glendale, California; in Solvang, California; Kimballton, Iowa; and Vancouver, Canada but gave out after following about five pages of links. "Now that you have aroused our curiosity, would you please let us know if you find her in Aitkin? Thanks!" Bob answered quickly: "I found the statue of the mermaid - in the town of Malmo, on Lake Mille Lacs, in Aitkin County, Minnesota - so Stacy was close. I figured that may be the likely choice since Malmo is a city in Sweden, just across the straits from Copenhagen and the story of the Little Mermaid was originally told by Hans Christian Anderson, a citizen of Denmark who was living in Copenhagen at the time. 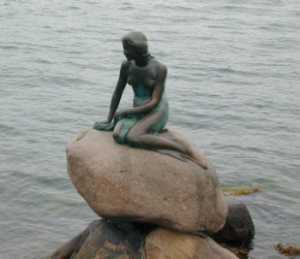 The original statue of the mermaid is in the Copenhagen harbor. There are lots of Scandinavians in Minnesota so the presence of such a statute would not be so unusual. So, over the Labor Day weekend I drove up there and after some hunting around found the statue. "Now this is just one more bit of information you can add to your history of Aitkin County. Let Stacy know she was very close. "I thank you for the effort you have made to find the statute for me. It was obviously not an easy task and you spent a lot of time on a project which was not even of your own making. Thanks again, Bob"
And thank you, Bob! Without your first letter, some of us would never have known that the Little Mermaid waits for her sweetheart beside Lake Mille Lacs in Aitkin County. Dear readers, do you have a picture of her? If so, please send it and we will add it to this page.